Begin your day with a gentle Hatha yoga class designed for those who need to stretch, strengthen, tone, and relax on a regular basis. 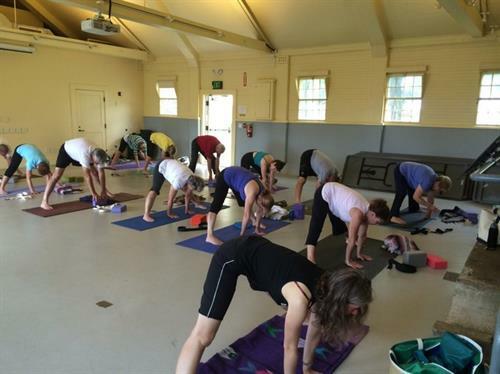 This 8-week series, led by Leslie Fiore, founder of Port Yoga in Kennebunk, will help you increase your strength, flexibility, and focus in the beautiful setting of the Wells Reserve. Class is ongoing and participants can join mid-series. Please bring your own yoga mat for class. Registration is required. Call 207-646-1555 x116. $80 members/$96 non-members. Wells Reserve at Laudholm. wellsreserve.org. Please note: This is an 8-week Tuesday morning series beginning on January 8 and ending on February 26. Every Tuesday from 8am-9:15am beginning January 8 and ending February 26. Registration required; please call 207-646-1555 x116. $80 members/$96 non-members.